I know Valentine's Day isn't that big of a deal for most people, but when you have kids, even the little holidays matter! I don't go overboard, but I do like to make holidays special for my kids. It really doesn't take much effort to make them happy! 1. Roll out some sugar cookie dough and let the kids use some heart-shaped cookie cutters. Once the cookies are baked, let the kids decorate them with icing and sprinkles. 2. If you have young kids, you probably have tons of broken crayons. Peel those crayons, break them into pieces, and place them in a heart-shaped baking mold. (I prefer a silicone mold.) Mix those colors! Bake at 300 degrees F for 15-20 minutes. You'll know they're done when the wax has completely melted. Allow them to thoroughly cool before popping them out of the mold. Voila! New crayons! Plus, you can bag them up and give them out as valentines! 3. Head to your local library and have the kids pick out some Valentine's Day books (or just use ones you already own). Starting on February 1st, read one each night until the big day! We love Happy Valentine's Day, Mouse! 4. Serve heart-shaped foods! Make heart-shaped pancakes or heart-shaped eggs using a metal cookie cutter. Serve those eggs with heart-shaped toast. You can make heart-shaped mini pizzas, heart-shaped sandwiches, heart-shaped grilled cheese, heart-shaped watermelon, and heart-shaped jello jigglers, too. Get creative with those meals! A simple cookie cutter can work magic! 6. Make some Valentine's Day slime. This is my favorite slime recipe. Dye it red, add in some confetti hearts, and it will be the most festive slime around! 7. Some red or pink playdoh, some heart shaped cookie cutters, and some craft supplies (pipe cleaners, beads, etc) will buy you hours of time! 8. 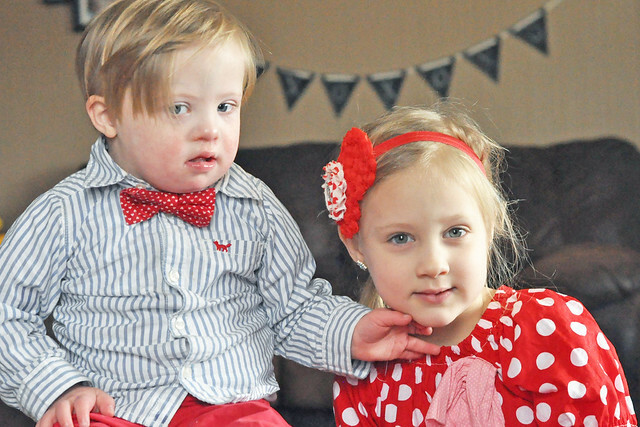 Buy a Valentine's Day shirt, outfit, or pajamas for your child. Check out THIS BANDANA BIB from Anchored Arrow Co or THIS ADORABLE OUTFIT from The Hair Bow Company. I just ordered the outfit for Lily and it's so cute! 9. Make a Valentine's Day craft. If you're extra ambitious (AKA not me), you can plan one for every day leading up to Valentine's Day. We've made thumbprint heart keepsakes, a bouquet similar to this one using foam hearts and ribbon, and paint chip bookmarks. 10. Make those Valentine's Day boxes for school. They don't have to be perfect! Just brainstorm ideas together and have fun! 11. Store-bought valentines are perfect in my book, but every so often, we get creative. The heart-shaped crayons paired with mini notebooks were a hit each time the kids handed them out. I love these ones for when Liam is in preschool! I need s'more friends like you and tic tac toe are two more of my favorites! 12. 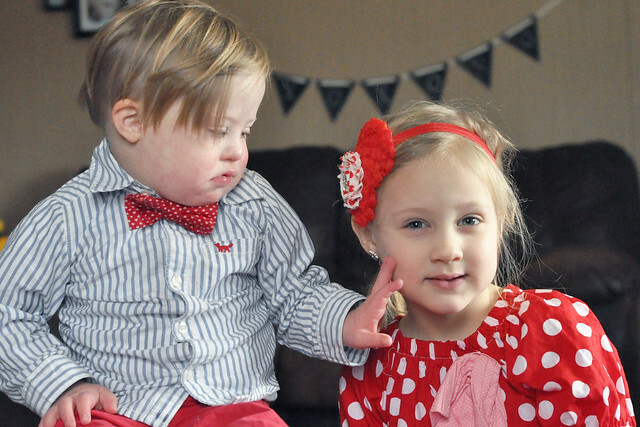 Take a Valentine's Day picture of your kids each year. We love looking back on how much they have grown! 13. Buy your kids a small treat and set it out on the table so it's the first thing they see when they wake up on Valentine's Day. We usually do a small box of chocolates and a very small toy for each child. They get so excited about these little treats! 14. Have a special meal on Valentine's Day. Choose breakfast, lunch, or dinner (or all of the above) and serve those heart-shaped foods. Valentine's Day plates, napkins, and cups make it extra special! The countdown to Valentine's Day is on! 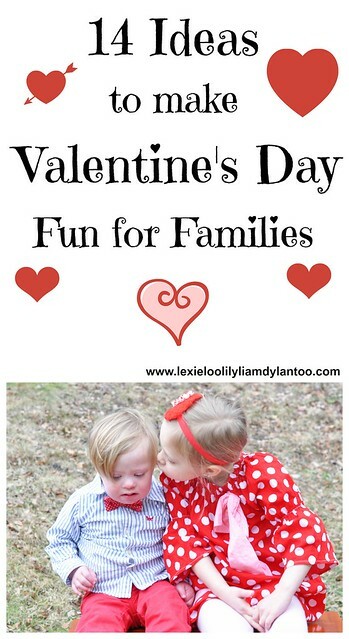 How do YOU celebrate Valentine's Day with your family? Linking up with Our Pretty Little Girls for Tuesday Talk. Great ideas. Love kids outfits. Thank you so much, Candace! I just love how Liam is so delicately touching Lily's face in the photos! Thank you! He always makes a connection of some sort when he's sitting with you. He will touch your face, hold your hand, or pat your back. I absolutely love that about him! HOW did I not know that Charlie Brown had a Valentine's Day movie?! We love all of the holiday Charlie Brown movies so we'll be checking this one out for sure! Thank you so much for sharing! I love all of these ideas! Thank you! I didn't know about that one until a few years ago. It's one of the very few Valentine's Day movies! Thank you! I'm with you on the just one. If I plan any more, it just won't happen! What a great list of ideas! Valentines always sneaks up on me. We really need to start doing some fun things! Thanks, Beth! It sneaks up on me, too. Hence the store-bought valentines this year! Haha! That's just part of the fun! Sounds like such fun ideas! I should set up a v-day photo shoot... I am so bad about doing that with my own kids. Trust me, I am, too! It always ends up being last minute! Thank you! We buy something very small. I'm not a fan of making it like a second Christmas!